Santos Dumont airport in Rio de Janeiro - the domestic airport surrounded by Guanabara Bay and Sugar Loaf. The second largest airport in Rio de Janeiro, Santos Dumont, sits few blocks from Rio on Guanabara Bay. It mostly functions to serve shorter distance domestic flights to and from Sao Paulo. It is also used for military operations. Although it no longer accepts international flights, it is still considered one of the busiest airports in Brazil. This airport was first used in the 1934 when a 400 meter runway was built on a land fill over the ocean. The runway was extended to 700 meters in 1936 and eventually 1,350 meters in the 1940s. A terminal modeled after the Pan American Seaplane Base and Terminal in Miami was opened in 1937. A new terminal for seaplanes opened in 1938 but was shut down when sea planes lost their popularity. It is now the Historical and Cultural Institute of the Brazilian Air Force. With the building of the Galeão International Airport in 1952, Santos Dumont reverted to domestic flights only. In 2007, a new extension of the old terminal was opened for the 2007 Pan American Games. In 2009, flight approach to the airport was limited. This reduced flight hours from 23 to 19 and decreased the number of passengers that could pass through its doors in a year from 8 million to 5 million. Currently, the airport is undergoing an 80 million dollar renovation in preparation for the World Cup in 2014 and 2016 Summer Olympics. The airlines that fly in an out of this airport include Avianca Brazil, Azul Brazilian Airlines and Gol Airlines. Passaredo Airline flies only to Goiania, Ribeirao Preto and Uberlandia and TEAM airlines only flies to Campos dos Goytacazes, Macaé and Vitoria. All the other airlines fly to Sao Paulo including TAM, TRIP and Webjet.Santos Dumont is known in the aviation world as having the shortest runways. Pilots flying the larger aircraft must be specially qualified to land at this airport. Santos Dumont airport is located just 1 km of Downtown Rio, it offers buses and taxis as of transportation to and from the airport. Real Auto Onibus provides service between Santos Dumont Airport and Galeão International Airport, bus line 2145, from 5:30am to 10:30pm. 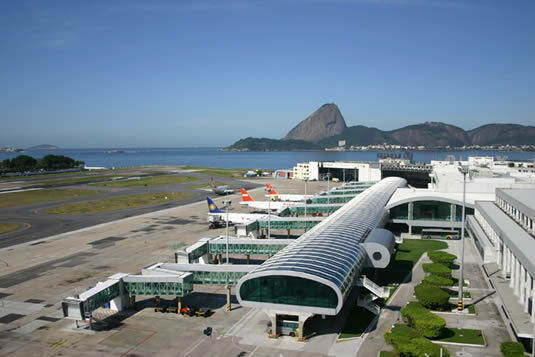 There is also the line 2018 that service between the Galeão Airport and terminal Alvorada in Barra da Tijuca, with stop at Santos Dumont Airport.The taxi companies that operates at the Santos Dumont Airport are:Transcoopass Radio Taxi, Transcootur, Coopataxi and Ouro Taxi.The airport also offers parking with capacity for 1024 vehicles, reserved parking for people with disabilities. The airport parking is located in front of the airport main building.